Postcard from ‘the war to end all wars’. A large plastic photo frame filled with a mosaic of weather-beaten images on the shelf in my father’s bedroom contained the memories of his life. That was where my search began, the journey which would lead us to Poland and beyond. They are like relics to me. There is an unnerving mystery behind them, as though history stole these people from us and left the images in their place. There are black and white photos of Wojtek’s mother and father. And, of course, my mother, his wife. Wojtek is the last living link between these long-dead people and me. There is one image of my grandfather, Henryk, which stood out in my mind from the time I was a child. It shows him as a young man in his officer’s uniform and was taken during the First World War. The image is mounted on a postcard. In those distant days, people would often visit the photographic studio, wherever it was that circumstances had compelled them to endure separation from their loved ones, and have a living image of themselves taken and mounted on post office cardboard. Kind words were inscribed along with the addressee’s information and within a few days, by the grace and wonder of the technology of those times, the self-same addressee would delight in the warm radiance of their distant loved ones gazing out at them. He cuts a smart figure in his officer’s uniform. It is well-tailored, with six shining buttons, two stars on the collar, and a pill-box hat with his regimental badge. Dignified. Debonair even. Later, he would come to resemble Hercule Poirot, with a sort of studious decorum and elegant awkwardness. But here he is young. He was just twenty seven years old when the photograph was taken. The verdant background – a hospital garden – serves to soften the reality that mass carnage is taking place in the world around him. A single medal decorates his chest, attained either through some sterling act of bravery, or, by simple virtue of the fact that he was still standing when the battle declined. This was the First World War after all; when the battlelines marched out on a conveyor belt of attrition. 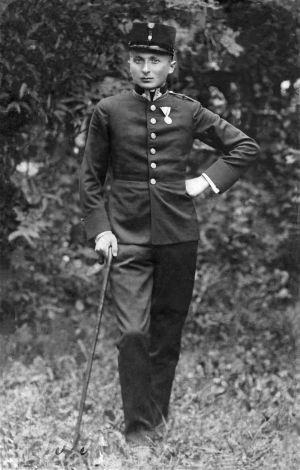 Henryk was born a Pole (a Jewish Pole) at a time when Poland had all but ceased to exist, so he fought under the colours of an Empire, the Empire of Austro-Hungary, a strange unwieldy sounding entity to twenty-first century ears. One of those old worlds, which sit in history books and are, in name at least, no more. Entente Cordiale, Tripartite Agreement, Little Entente – political expediencies of a now ancient Europe, which heralded peace and protection through amalgamation and somehow are no more. No more because the peace and protection they afforded some were at the expense of others. 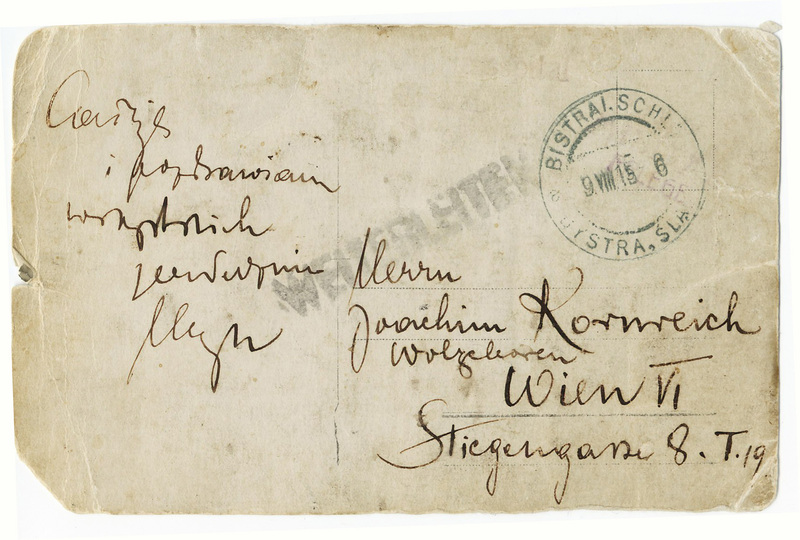 According to the postmark on the back of the postcard, it is the ninth day of August 1915 and Henryk is recuperating in a hospital for officers in Bistra, Silesia. He writes in the elegant hand of that time when so much was written by hand. The original addressee of this military portrait is given his titles in German, Herren Wohlgeboren Joachim Kornreich. The double honorific hints at the politeness of the age and the standing of the addressee: Mister Well-Born Joachim Kornreich. The main message appears in Polish: A kiss and good wishes to all. Henryk. It seems surprisingly cheery for a postcard not simply from a war, but from a war which was christened ‘Great’ and bore H.G. Wells’ unfortunately inadequate sobriquet ‘the war to end all wars.’ This Joachim was then living at the centre of the Empire, in Vienna. He is Henryk’s father, and so my great-grandfather. Their surnames differ, father’s and son’s, out of no family dispute. Our family were in fact the Kornreich-Korowicz’s, a double-barrelled conjunct of good Austrian and Polish surnames. A sign perhaps of my progenitors’ life under Austrian rule and in particular in eastern-most Galicia, an Austrian-administered territory whose capital Lwów held a majority Polish population. The names were used interchangeably, with a preference for using each in its respective milieu, the Polish name in Polish circumstances, the Austrian when dealing with more international issues. This was certainly true before 1918 when Henryk, who was to become a successful economist, began to publish books and papers on monetary issues affecting the global economy and the Austrian Empire under the name Kornreich. After Polish independence, when the best of his career was achieved, the name Korowicz dominated but he was known professionally in Kraków and Lwów both before and after Polish independence as Dr. Korowicz. This was not remarkably strange in those times, in those circumstances, in a multi-ethnic Empire, before the clash of nationalisms and ideologues. The use of multiple names also hints at another more sinister aspect of Europe one hundred years ago. It was not uncommon among minority groups and especially the Jews to adopt a name of the land where they lived. This was both a salute towards integration, and a form of protection against the pogroms which had become a disturbingly repetitive feature of the Jews’ European migrations. The Polish King Casimir III had famously bucked a trend once and invited Jewish immigration in the 14th century but these were different times. This was the age of the scapegoat, the birth of populism and people power, when political shifts demanded the unmasking of a hidden enemy. Anti-Semitism would soon find a warm niche in the new Polish Republic, which had been starved of nationhood for so long: while to the east and the west of Poland, the Jews would fare far worse. The changing game of Europe’s Empires and dominions was about to lead to a bloody re-christening of the past in the years that were to follow Henryk’s Great War. In a brutal atmosphere of blind nationalism and radical social experimentation, names became badges of honour and marks of shame. Names would lose the nuances that described the communities they had lived in, the neighbourhood recognition of interconnections, local histories, friendships, and loves lost and gained. A time would come when your name would denote only your national allegiance, your ethnicity, and your social class- three elements which marked your cards before your interview with destiny, when the knock on your door might be the last time you opened the door. Many names disappeared forever. On a wisp of wind, like grains of dust. Some names remain only on gravestones, on brass plaques, on stone monuments, in history books, or on the lips of the old. Wohlgeboren (‘Well-Born’) was a honorific title, used by lower noble ranks and civic notables. Henryk’s publications, written for the specialist and the student, in both Polish and German, include the following titles: “Gold Currency in Light of War” (1918); “Proprietor and Peasant in Poland and particularly in Galicia”; “Studies on the Depreciation of Currency and Other Economical Questions”; “An Outline of Commercial Politics” (1930); “Politics of Trade” (1931).